I’m a lead developer for SpeedFixTool.com. It’s one of the most exciting companies I’ve ever worked with, and I’m extremely proud of our product, our services and especially all of our wonderful customers. …I immediately checked with our support staff. I personally contacted our customer base. The feedback we receive from customers is overwhelmingly positive – I couldn’t figure out where these accusations where coming from. At first I was upset. I was angry. I thought maybe it was a smear campaign by a competitor. For a minute I thought that maybe people are just cruel – but now I’ve finally figured out what the problem is. …I completely understand why people would accuse us of being a “scam” company. Don’t get me wrong, I’m still just as proud of our company as I’ve ever been. I sincerely believe that we offer a unique and extremely valuable service, that our customers truly appreciate what we do for them and we’re certainly not a scam. 1. 95% Of Complaints Are Not Our Customers. The majority of comments come from our ads we use to promote our product. And the complaints from actual paying customers are extremely rare, quickly resolved and are normally related to support issues common with any software products, not deceptive business practices. Our software is designed to speed up slow computers by diagnosing and automatically repairing problems in the registry. There are a lot of companies out there masquerading as “registry cleaners” that don’t really fix anything at all and load your computer up with malware, adware and viruses. They use the allure of a “faster PC” to trick unsuspecting people into downloading software that actually harms people’s computers. This is the exact type of problem that we solve. Our product actually DOES work as advertised. And there’s ZERO malicious software installed. In fact, our product was designed to solve the problems caused by these malicious programs. But because our software actually improves PC performance, people assume we’re just like the deceptive products they’ve seen in the past – products that forge scan reports, distribute malware and are designed to cause problems, not solve them. Our product solves problems, and our customers send us amazing feedback daily. SpeedFixTool isn’t like other “PC cleaner” products, but we can’t blame people who’ve been burned in the past for believing otherwise. In our defense, these complaints are coming from people making assumptions about our company – not our users. 3. ScamAdvisor Is Deceptive To Consumers. Age Of Domain – We’re a relatively new company. Our domain name is right at a year old. Just because you’re a new company doesn’t mean your scam. ALL companies are new at some point. Location Of Company – Basically if you’re not in the U.S. or 2-3 other countries, you’re automatically penalized. There are many great companies who aren’t based in the U.S. 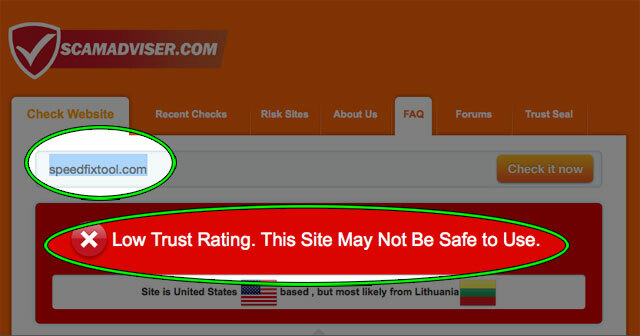 So if you’re a new company, and you’re not based in the U.S. – you’re automatically given a low trust rating. It’s based on factors that have nothing to do with the quality of your product or integrity of your company, simply assumptions based on factors that have nothing to do with the operations of your company. If we wanted to be deceptive, it’d be easy to purchase an aged domain and register it in the U.S. But we’re transparent in everything that we do – the simple fact is that ScamAvisor punishes companies for being open and honest. 4. People Think Paying For A Product Is A “Scam”. Many of our complaints are “they want you to pay for it”. We may have accidentally mislead customers with our initial launch ads. The “analyzer tool” is a free download. The repair tool is paid. This may have confused some readers, however we wanted to let people see the improvements they could expect before deciding to try the paid software. We keep it as affordable as possible ($39.95 – sometimes discounted to $29.95). Sure, there are similar products out there that are “free”. Nothing’s free… Many of them install adware to make money. Others sell your browsing, data and buying habits. And we’ve put our product head-to-head with some of the most popular competitors software out there, both free and paid – in many cases our software fixes issues that the more well known products can’t – because our product uses a completely different (and often much more effective) approach to repairing and improving PC performance. We price it as affordably as possible. It’s a one-time payment and there’s no hidden charges. We also have a full, no-questions asked 30-day guarantee money back guarantee. If you’re not completely satisfied, simply request a refund and your money will be returned within 24-hours. 5. Our Customer Support Is The Best In The Industry. 100% of support emails are promptly replied to, usually within an hour. Never longer than 24-hours. Every single request gets personal, one-on-one attention to answer any and all questions that you may have – that applies to both paid customers and free-trial subscribers. We get feedback like this countless times every day. We have a 96% customer satisfaction rate, and our product helps to solve problems that nothing else on the market can do. The “Speed Up Your PC” software industry has a bad reputation, and rightly so. We made it our mission to create a tool that actually works as advertised, is affordable and dramatically improves PC performance and speed – without malware, spyware, viruses or creating problems instead of fixing them. We mistakenly expected the quality of the product to speak for itself. We were caught off-guard by the barrage of negative comments, preconceived notions and misguided accusations based on assumptions from previous experiences. Luckily, our product IS speaking for itself. 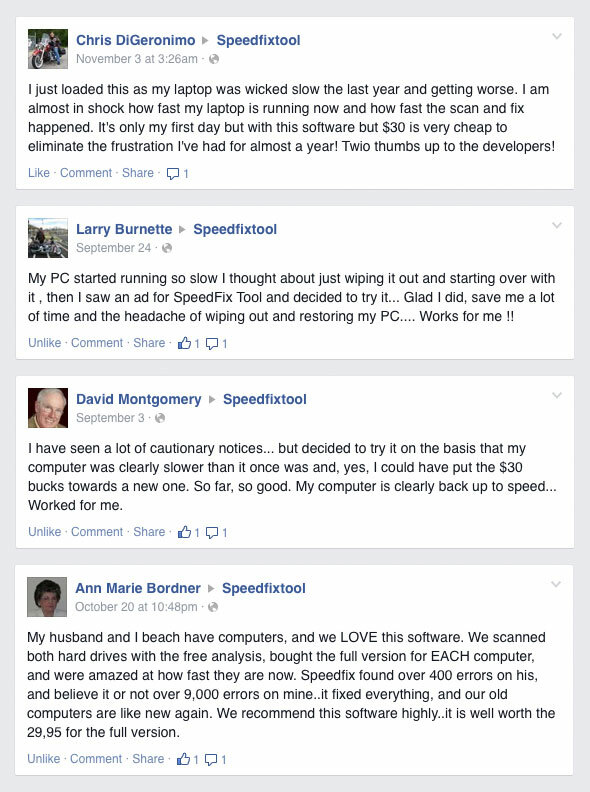 And our satisfied customers are helping to spread the word that SpeedFixTool isn’t a “Scam” – it’s a technological breakthrough that improves speed and performance in ways never before possible. Myself and my team have worked for years on this product. We’re extremely proud of what we’ve accomplished and what we plan to accomplish in the future. We’re incredibly grateful for our thousands of wonderful customers, and we’re passionate about our work and the feeling of knowing our product truly helps so many people gives us all a great sense of purpose in our work. We’re not just coding software. We’re helping people to save time and money, to work faster and eliminate headaches caused by slower computers – and we’re revolutionizing an entire industry. Our team’s mission, hard work, dedication and passion for creating solutions to problems faced by millions of people is far too important to allow them to be accused of being scammers or to allow these misguided accusations go unanswered. We can understand the assumptions and the accusations. But it’s not fair to us, our customers and those we’ll help in the future to not make it clear in no uncertain terms – these accusations are wrong. We couldn’t be more proud of our team, our product or our users, and we’ll do whatever we need to in order to overcome allegations that misrepresent our company and our mission – and we’ll continue to provide a much needed (and appreciated) service to our customers for years to come. 158 Responses to "SpeedFixTool Scam? 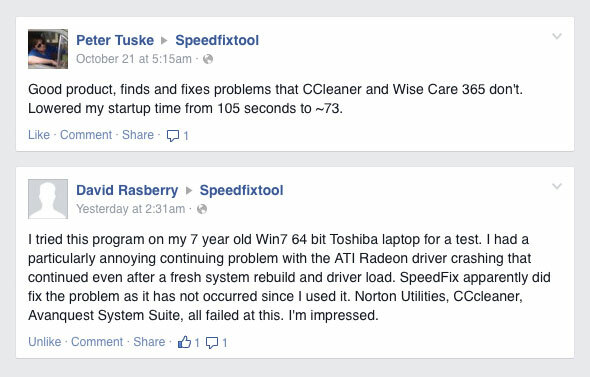 One Founder Takes “RipOff” Accusations Head-On…"
Yes, speed has slowed but my 6-yr-old desktop runs on Windows XP which is no longer supported, updated by MS. How does this speedfix tool cure the lack of support or basic serviceability going forward? SpeedFixTool helps maintain your computer properly even though Windows XP is no longer supported by Microsoft. Please read this quick article to understand SpeedFixTool features better. I am very sorry but this is a scam. Once I called and finally got a real agent, I could not understand his dialect. He got onto my computer (log me in) and showed me how slow it was running. I felt like he was taking me for an elderly person who does not understand computers.He was very wrong there. After giving the spill and seeing what was on my desktop, he noticed Geek Squad. I commenced to tell them I am extremely happy with them so he told me they were not a Microsoft computer party. I thought neither are you. As he kept talking I immediately saw what he was attempting to do. Shew me programs running in the background which all computers have that and trying to see me more than just the $39.92 initial cost. It was late at night and I am sure I got a little upset but I told him he was taking advantage of people who were desperate to have a faster-running computer. After putting down Geek Squad, that is not kosher. I told him to get off my computer, I knew what he was up too as I have been suckered by that from an HP company who was not HP. They are out there and hate to run into them. Never go here.I want my money back but know one will answer my call. Thank you for bringing this up to our attention. I would like to apologize for the bad experience that you had with our phone support partner. Since we are just a small startup company, we decided to outsource our phone activation needs to another company. They do sell an extra service – a remote repair, but it is targeted to customers who have other existing issues beyond what SpeedFixTool can fix. This, however, is only optional and never obligatory. If you don’t want it then a simple “No” should warrant obedience. Was the representative disrespectful to you in any way during the support session? We are not like the companies that you are referring to. We have worked hard to earn a reputation in this side of the business and we are bent on living up to it to the best of our abilities. How I wish I could have made it a positive experience for you at least. it doesnt, this program, like all other speed fixes, is a scam. Try reformatting and installing your machine from scratch, if its still slow you have a hardware problem, which no program can fix. I totally agree that if it’s a hardware problem then no software can fix it. For everything else, you can certainly try ours. If you haven’t tried it yet then please don’t tag us as a scam. I hope you exercise fairness on your evaluations especially when you share it to the world. Purchased rhis oftwarre, tried for 3 days to aactivate, no go. Then out of frustration I called the 1888 number they llisted. Only tobe told, If I would just let “them take control of my screen, they would be happy to activate it for me. Sounds like a major scam/attempt to hack!! I’m sorry to hear that you haven’t activated the software yet. I can definitely help you with this one. I tried sending you an email along with your key and an instruction on how to go about with the activation but it didn’t go thru. Will you be able to provide me a working email address please? I would like to resolve this for you once and for all. We also offer a remote support session to assist customers like you in activating the software. If there’s ever a conflict then it can be resolved in real-time. I totally understand your reluctance though and I can’t blame you for feeling that way. I’m just here if you need assistance. I’m a Digital Technology Technician, it is a scam. I would love to hear your reasoning to why you think it is a scam. We do not engage in any form of email marketing so you don’t have to worry a thing about it. 1) The banner “Free Download – Diagnose and fix your computer” has the Download.com/C-Net signature down logo on it. However, the download is not on C-Net’s servers. Although it proves nothing, it does fall under deceptive practices. It’s like buying a Hamburger from a small restaurant, and the burger wrapper has the golden archers on it. But. it does not have the name McDonald’s on it. 2) The page at http://speedfixtool.com/lp900/grv/la2-2-freescanms-3.html?geo=us&pid=31829283457&plc=31829283457&adid=%7B%24requestID%7D&var4=typesomething has a cookie crumb to make it look like an article from a tech review site, but the cookie crumbs are not linked to anything like it should be. Why have the cookie crumb that does not fit the web site structure and with no links? Then again the that page does not utilize the same template as the rest of the site, which gives me the impression that the site is trying to deceive the consumer. 3) No 3rd party endorsements. It’ll help if speedfixtool.com would reach out to reputable reviews like CNet, PCMag, etc. and have them do an article about your product. Without endorsements, I be wary to try your product out. 4) Microsoft certification. Is this product certified by Microsoft? This tool cleans out the registry right? I would never use any software utility that cleans the registry if it was not certified by Microsoft. if It is, can you please provided you Microsoft ID# so that I can look it up on Microsoft.com? There’s more, but I am not here to bash your product. I’m just pointing out why people this it is a scam. 1. The “down logo” that you are referring to in the banner is not a logo, it is an icon, a design element that is widely recognizable as a part of a download button. It intuitively suggests the download action. It’s not Cnet specific. Many download icon variations are used by different vendors and they all mean the same – a download action. 2. I am not sure what you meant by “a cookie crumb”. The article is a part of our content that is available in our blog. The page has a different design because it’s used as an advertisement and this type of advertising is compliant with FTC. Please note, all the links and menu buttons work, they are not an imitation. 3. We do have 3rd party reviews. They are genuine reviews submitted by our customers to an independent product review site. We decided to focus on customer reviews rather than professional reviewers because customer feedback is the most pure unbiased evaluation available. 4. To my individual knowledge Microsoft does not verify any products created by 3rd party unless Microsoft was involved in creating it. I have just been charged for the whole thing. Our free trial version scans your machine and checks for computer problems free of charge. A paid subscription though is needed to proceed with the cleanup process. I also checked our records and was not able to find any purchase under your name nor under the email address that you have here. If you have any concerns with it then please send us an email at [email protected]. If you’re not satisfied with it then I’ll process a full refund for you. I can understand your frustration. In our article we speak about a Free Analysis Tool, i.e. a free trial version diagnoses computer problems for free. To clean the problems you have to pay. This is explained in the article as well as in our pricing page. Give it a try! We have a 30-day money back guarantee in case you are not satisfied. I am confident though that it will be a worthwhile experience for you. To upgrade to our premium version, please click here (instant $10 discount will apply). I fully respect your take on this and I do hope that we can add you to our long list of satisfied customers soon. Kindly check the response that I gave on your other post. I can assure you that we have already processed your request for a full refund. It’ a scam Amber. I have called their billing department all morning long and no one is answering. It is now 10:00 AM. I just want a refund. Our records show that a full refund has been processed on your account at exactly 08:12:28 AM, Wed 06 Apr 2016. You should have received an email already regarding this. If not, then please be informed that from our end, a full refund was successfully processed as per your request. I can assure you, that you won’t find any of our customers who’ve complained about any hassles getting a refund. It’s as easy as sending a quick email at [email protected]. As always, your satisfaction is always our priority. I still respect your take on this and hope you all the best! You know it I know it you are a bunch of dishonest cheats. Anybody who is stupid enough to buy your product almost deserves to be to be ripped off. And your replies regarding your young upcoming company in the ‘industry’ are a lot of wind and piss! By and large you are defrauding vulnerable gullible people – and then you have the cheek to try and justify your actions – shame on you. In what way have we cheated people? As far as I know, our service is top-rated on a 3rd party website way better than our competitors. We never leave out any of our customers in the cold like many companies do and we are quick to admit our mistakes if ever we commit one. If that is how you see businesses like ours then I respect your opinion in the matter. I just don’t agree with it. You can find feedback from existing customers of SpeedFixTool on Trustpilot, a trusted independent review site. Click here to read reviews about SpeedFixTool. As you can see our valuation on there has been average. People rate us either 5 stars, or 1 star. This is because the effectiveness of the cleanup depends on a computer’s condition. Some customers see a great improvement in performance after using our program, others don’t notice any changes at all. The effectiveness of the program depends on the computer’s condition. The older your computer is, the more effective cleanup is. Please note, you are covered by our refund policy. If your not happy with what you get, just let us know and we will refund you right away. Between, the reviews on our website came from actual customers. This was a true voluntarily feedback left on our Facebook Page. Also, here is another feedback from our customer left in the comments below one of our post. user review sites like Yelp and Trustpilot cab be manipulated. Again, as David specified, please post links to third party reviews if you want to be taken seriously. Trustpilot is a trusted source. They verify every single review. It’s connected directly to our customer base. Then again, our score is not great on there, it’s average. That’s not what people who manipulate do. You can manipulate 3rd party reviews, such as softonic.com or download.com, but not reviews from actual customers. Regarding additional 3rd party reviews, that is all what is available as of now. Since we receive more requests like yours, we are working on getting them. anyone can say anything about a ‘trusted’ website. What Im seeing is a lot of names of happy customers, reminds me of the old “curatives” that snake oil salesmen used to see. All their customers were happy happy folks, cured everything from falling hair to ingrown toes. yep. The feedbacks of a lot of happy customers were all genuine. What would you rather see there to make you believe that they are true? It won’t help at all if we make generalizations on everything we see. If you scroll down, view all the reviews, you would see that there were a lot of negatives as well. We are not happy with those too but we decided to do something about it and focus more on really attending and listening to the needs of all our customers from that point on. As a result, we made a lot of our customers happy with our product and our service. Why penalize us for that? With regard to our “miracle worker”, we’re glad he’s on our side. We are pretty much a small company and we’re proud that we are doing something really good from our end. By few or by many, we would still accomplish the goal of serving customers around the world the best way we can. I hope you get to appreciate things like that when you see one. Lastly, we have a lot of customers who use XP and they can tell you straight up that our software did help. There’s really no magic to it. Once a computer is set up accordingly and maintained in a timely manner, even your old computers would still be of good use maybe 5 years down the road. I wouldn’t consider our software a new set of handle bars nor new tires… but rather more like a WD-40 which can turn squeaky bicycles into better performing ones. You’re using shallow marketing… none of your reviews are from any known reputable reviewers, you’re not on CNET download.com, all your reviews and accolades on your website are all just postings from supposed customers, you don’t show any certifications like Microsoft Gold Partner. One best single thing you can do is submit your product to a professional review… like at least CNET. But you haven’t… which makes you suspect. You want to see product placement done right… go look at Auslogics site. Thank’s for the advice. We will certainly go for cnet.download.com. Reviews on our site came from actual customers, and they are available on our Facebook page along with negative reviews. We receive bunch of different feedback. People like our prodcut, but some people find it useless. It all depends on the case, because every PC is different. However, if we don’t deliver what we claim, we always refund money. Easy to tell text is written by chinese person because lack correct grammar and lack use of ordinary english language adjectives. also advertised as free service for limited time but then at end get notice to pay to continue. typical internet scam. Your derogatory remarks against a race without any regard for the audience of this blog is uncalled for. We have always had an open ear to customer suggestions on how we can improve on our services on all levels but this is just not one that I will even consider. If you still want to consider our offer a scam that’s your call. I still hope all the best for you. Easy to tell text is written by chinese person because lack correct grammar and lack use of ordinary english language adjectives. also advertised as free service for limited time but then at end get notice to pay to continue. typical internet scam. .
It’s easy to tell the editorial was written by a non-native English speaker, I would adventure to say asian… chinese if I’m lucky. This is clearly noted in the missing articles, pronouns, lack of capitalization at the beginning of a sentence and incorrect order of words while creating a sentence. The product itself is advertised as a free limited-time service however the program clearly shows a bate-and-switch agenda when you are required to pay for repairs after initial scan. Re-written by a non-native English speaker. I am looking for a centered answer as to what this product really is. I agree with part of the lot that this product is being marketed in a way that has burned a lot of us Internet users. We are used to this method that has had infected us with malware, that has taken our money and served us with more pain than relief. There is a chance that the product does work in the manner advertised but with out a pivoting point we can’t believe any of the claims of this company; either we risk and pay the money for the product and change our minds or back to feeling suckered again and people are tired of that. Dear Fastagain, I can see your perspective from the point of view of a very small company trying to make a living. I hope you are who you say you are and your product be as good as you say. You sound clear and convincing with a strong ethos, but people here are scared to lose their hard earned money, and face, to a yet once again scam on the Internet. I suggest you try a different angle, at least for a while so you can gain some stance in the market. At this point the warning is clear and I can’t see my self wasting my money on your product, I wish you luck though. On the other side trolls be trolls. I totally agree that transacting online nowadays has never been easy, with the advent of fly-by-night companies that are bent to just make money out of very dubious claims and offers. We maybe a startup company but we have committed ourselves to address all issues that come our way, may it be positive or negative, just to fully show our truest intentions in this side of the business and that is to offer an alternative to most established brand names in our segment. In line with this, we would like to make it easy for customers like you to evaluate our software for a very limited time. Just send us an email at [email protected] and we’ll provide you a 30-day trial key for your evaluation purposes. We do listen. If it’s something we can adjust on our end to better serve customers like you then we’ll do it. We stand by our claim that every computer is different. Even if they have the same hardware specifications, manufacturer and OS, you can only hope that they both respond as you would have liked them to. Apparently, that’s not the reality. I fully respect your take on this though. With regard to your other concern, I have already addressed this from one of the responses I made. Since we are just a small startup company, we have outsourced our phone activation concerns to another company… to meet the growing needs of customers like you who need some assistance with the activation process. I see no issue about that as most of the major companies in the world have opted to do the same thing depending on what their needs are. If you have any other concerns then I encourage you to send them to us at [email protected] so we can attend to it right away. I am afraid of downloading an unknown program. My computer was invaded in the past by a company that called and claimed to represent Mricrosoft. Supposedly they were authorized. Had to completely rebuild my computer and I’ll take slow versus the problem I had in that situation. An unknown Download scares me!!! I can understand your concerns, and if I were you I would be the same. There are some programs that are free to use but contain adware or distribute other unwanted programs within their installs. We are not that program simply because we care about our customers, and we make money by license sales, thus, we don’t need to do sneaky tricks like others to return our investment. Our program is clean from viruses, adware and malware. It’s a small size scanner which can not harm your PC. Eventually, if you don’t like how the program works, you can uninstall it. It may well be that you’re a bunch of honest folks plying a good product. But that is not what your web site says to me. WE ARE NOT HONEST PEOPLE!! WE DESIRE TO TRICK YOU INTO BUYING OUR STUFF!! So maybe you folks aren’t scammers, but the folks who set up your web site clearly thrive in that world. My apologies if this is untrue, but your web site has a very strong smell of dishonesty, blatant attempts to mislead and deceive and is far, far away from what I’d expect of a reputable business. Is this Sr. Developer Josh even a real person? Since when buying ads is a scam? Have you ever heard of Sponsored Content? Everyone does it, Toyota, General Electric, Geico, you name it. If you think that buying ads for sponsored content is a scam, then every business should a scam according to you. Where are you located? I have seen several comments asking the same thing. Why is it that you won’t give a location? Our location is listed in our contact page. We are based and located in Lithuania. I went to the download page (https://speedfixtool.com/download/). Downloaded the file and scanned it using Virus Total. The results showed 4 viruses (virii?). I then googled SpeedFixToolPro298 and found another scan showing 2 virii. So there you have it. What you say now??? I guess there is nothing I can say to you in particular that would change your mind about us, because your tone indicates that you are very upset with us. I am sure we would be able to help you if you explained what happened. Feel free to contact us at http://support.speedfixtool.com. Regarding your question, I am actually greatful to you for bringing those reports to us because they serve as a proof that we are virus/ malware/ adware free, and we have not been flagged by any major antivirus company (Avast, Norton, McAfee, Microsoft Security). Yes, we were flagged by a few (6 out of 95) small market share AV products as a potentially unwanted program which is completely differenet from virus, adware, malware by definition. Reason for that is user complaints. And getting user complaints is normal in a technology business, because no technology is perfect. I am pretty sure if you checked our competitor installs you would get same results, if not worse. However, we respond to and resolve every single customer complaint that we receive, and our money back guarantee is valid 100%. Thus, every user is safe with us. I like how you didn’t deny that a virus scan would come up with viruses, only that no technology is perfect which somehow excuses you from what you’re doing. With regard to virus detection, please check out our latest response to Nathan and see for yourself that most of the world’s best antivirus programs have nothing against our program. You seem to have misunderstood the report you have got from Virus Total. The report tells you that out of 56 antivirus scanning products 4 of them reported something on SpeedFix. 2 of them reported it as potentially unwanted. The other 2 (which seem to be the same company) report it as (I think) adware. I’m nothing to do with SpeedFix and have no opinion on it currently as I was just looking through reports on it, but saw your post and felt the need to point out, for other people as well as you, the confusion. Wish they’d give it a different name though, so many programs with similar names, its very difficult to tell them from each other and get decent info on the right one! Thank you for your suggestion. We like our product name though as it represents our mission in giving computer users a chance to speed up their computers with our tool. Hope you can try it too! Just send as an email at [email protected] so that we can give you a complimentary key for your testing. Avast is a free antivirus that detects things it gets updated to know, the database has not been updated to detect recent activity like new programs. I couldn’t agree more. Thanks for trying our product. There are an awful lot of cheap virus scan softwares out there that give false and erroneous results. Many of them will indicate any .exe file as a virus even though it is not. Beware of cheap inaccurate virus software. Even some of the “better” virus protection programs can give false results. We never claimed that SpeedFixTool is an antivirus software. Although our program is virus-free and malware-free, it is not an antivirus and does not act and perform like one. Ours is a PC optimizer and cleaner which helps maintain your computer for it to perform smoothly for a very long time. Scam. All i’m saying. I installed it, now i get advertisements on my desktop. I sent you a follow up email regarding this. What makes you think it is SpeedFixTool responsible for the unwanted ads? Just so you know, we do not distribute neither adware nor any other 3rd party software. It’s 100% clean from adware/malware/spyware/viruses. wether? I was reading your alleged e-mails and responses that exuded with intelligent responses. I was definitely interested in your product until I came across your usage of “wether”. It stopped me cold and I lost interest do to the usage of a word that defines as a castrated male sheep or goat. Makes me wonder about the quality of your product as opposed to the quality of your word usage . Thank you for your interest in our software and for pointing out the grammatical error in our response. Post reviewed and edited. We do listen. I hope you can still try it out. If you’re still interested, please send us an email at [email protected] so that we can give you a complimentary key for your evaluations. this is a TOTAL scam!!!! it installa fake viruses then pretends to clean them, just like all the other scams. now pretending to have a REAL employee be insulted by the lies about the company only makes it worse. like the CNET scam all over again. PATHETIC!!!!! SpeedFixTool is adware / malware /spyware and virus free.﻿ Also, our tool does not install any 3rd party programs which are usually the source of unwanted ads. Our software is 100% clean from any malicious software. If it’s a bad thing to fight for your company’s reputation then let the burden fall upon us. We’ll do whatever we need to in order to overcome allegations that misrepresent our company and our mission. don’t use this tool, this type of software will fake 100’s of error just to make you think that your machine need to be repair. I would recommend sites like: http://www.dslreports.com/ they have great forums with posts from “real people” they will guide you step by step on how to clean your system. SpeedFixTool is not like the others that you may have tried in the past. Our software provides genuine scan results all the time. It maybe easy for you to follow some set of instructions because you are tech-savvy but not everyone has that luxury. That’s where SpeedFixTool comes in. I believe that if our customers know how to really maintain their computers in an advanced way, then they really won’t need ours at all. However, our tool makes it easier for non-technical people to optimize their computers with just a few clicks of a mouse. Consider whether the reviewer’s purchase has been confirmed. Amazon and Trustpilot have ways to confirm whether a customer who left a review for a product has indeed purchased it, but this system can be abused. Also, was this review done really as an independent one? Why then have this at the bottom part of the page? Seek company and product recommendations from reputable publications. Look to Which? and MoneySavingExpert.com rather than consumer review websites. I was pretty disappointed about this “great free tool” to fix a slow PC. THEN I find out its just like all the rest-run up the numbers and use scare tactics that your PC is about to explode if you dont pay us. If youre going to offer something for “free” then make it free and let people use it to see what they think-ANYONE can make an app saying your PC is infested. My apologies for the confusion. We do offer a free analysis but the cleanup is a paid one. However, if you send us an email at [email protected] then I can give you a complimenatary key that you can use for your evaluations. Hope that helps. Speed fix tool may be completely legit but it is far too expensive. If it is being sold for $30 in the US please explain why, with the existing exchange rate, it is priced at £30 in the UK? That’s the rip off! I understand that there was some confusion regarding the price setup on your region. I hope to clarify this for you. We offer our software at a flat rate of 39.97 whether in USD, CAD, EUR and GBP. It entirely depends on what region you’re from. Our platform detects it automatically and offers it as it is. You maybe saying that you could end up paying more but when you also look at our offer in Canada, then we are offering it at a far lesser rate as well. That’s just how it was setup and we like it that way, not to complicate things up based on varying exchange rates as we offer our software globally. I hope I was able to help you with that. I “tried” downloading it just to prove the point it is a scam and I was rite. My virus protection stopped the download calling it a threat. Now seeing as I am not the only one who have picked that up and nothing being backed up to prove it’s not a scam, the whole program may as well be taken down and you can stop trying to take peoples money for malware. It is a scam. Not a computer fix. Proven by multiple people. End of story. I already responded to your previous comment regarding the virus detection issue. Please check it out. I can assure you that SpeedFixTool has passed all programming and ethical standards in software development and in no way should threaten the integrity and protection of your system. Our software is free from any form of adware, spyware, virus and malware. And fyi, it was Avast that stopped your download. Please read back a bit and see my latest response to Nathan regarding Avast. Just don’t know who or what to believe any more ! Deception is created by unscrupulous operators promissing resolve of all ailments of computer issues.yet the same problems reocure worse than before. I am NOT knowledgeable of this technology, having subscribed to Best Buy’s Geek Squad ‘s service, they mest up my computer more than fixed, finally reverting to Frontier / Yahoo premium tech service which were a little better, but still far from acceptable. A reputable and efficient service has a cost,,,,What is the catch here ????? Just wish I could “BELIEVE” ! my computer to fix what ever happened as a result of using that FREE option ??? Which I would feinitely pay double if it does work as described ,,, WILLINGLY ! Even if they offered their product for double the offered cost ,knowing that they will back up their with a complete resolve , I would be willing to “BELIEVE ” and suscribe ! Therefore , SPEED FIX, what is your answer ? I have also read several opinions, !!!!! YES , reviews and opinions are a penny a dozen,, many written by ignorant and equally,,,,,, know it all individuals…make shift want to be knowing ???? Give it a try and click here! We have a 30-day money back guarantee in case you are not satisfied. I am confident though that it will be a worthwhile experience for you. There have been 1000s of other analysis companies in the past. what is this one doing different? they are like all the others……..analyze for free..download..it performs the analysis now you have 10k discrepancies….now PAY for us to fix it…..really? Sure, there are similar products out there and some are even “free”. Nothing’s free though as a lot of them install adware to make money. Others sell your browsing, data and buying habits. We don’t. We’ve put our product head-to-head with some of the most popular competitors software out there, both free and paid, and in most cases, our software fixes issues that the more well known products can’t. SpeedFixTool uses a completely different (and often much more effective) approach in repairing and improving PC performance. We also have a full, no strings attached 30-day guarantee money-back guarantee. To upgrade to our premium version, please click here (instant $10 discount will apply). If you’re not completely satisfied, simply request a refund and your money will be returned within 24-hours. You won’t find any of our customers who’ve complained about any hassles getting a refund. It’s as easy as sending a quick email. Yet another scam. And their offer of a free analyses is laughable, every developer of this type of software allows you to download it for free after which it will scan your computer and tell you how many problems have been detected BUT and here is the clincher, you will have to pay for the software before you can fix any of the so called problems. The fact that every single one of these so called computer speed up tools gives drastically different results after scanning your computer means that you are paying for a gimmick that in reality is nothing more than a technical placebo. Kindly check the other comments that I made regarding our free version. Also, I wouldn’t call a program that has been downloaded over 50 million times in the entire world as just a gimmick. Have you ever tried our software at all? I totally understand. Kindly send us an email at [email protected] and I’ll send you a complimentary key for your testing. I have downloaded the SpeedFixTool for my Windows 10 computer in response to the article indicating that it is “FREE” for a short time. I expected to pay a fee after initial TRIAL and satisfaction that the product was and is working properly. Have personally paid and lost over $200.00 dealing with other parties with similar claims of “improvement”. Have now been confronted with a pay now screen after completion of the “SCAN” process step. What happened to the “FREE” statements? Would like to complete my test and be able to make the decision to purchase or ignore the product. I greatly fear sending money after spending nine (9) months clearing up my personal bank accounts and not receiving the services indicated nor receiving any refunds. Please consider this a statement of personal fear and not an indictment of the product, company or any person. I totally understand where the reluctance is coming from. I would feel the same way if I already experienced what you have actually gone thru. I would be more than willing to send you a complimentary key for your evaluations. Please send us an email at [email protected] so that we can help you with this. When I saw these guys ads, I thought, “The reason my computer is slow, is because it is slathered in peanut butter?” So, I opened my computer up, and found out… They were right! There was peanut butter in my computer. So, I asked my best friend to look inside his. It was there too! So, then I took the case to all 27 of my neighbors, and every single one had peanut putter in their computers! So we all agreed to put SpeedFixTool on our computers, and check again after a week. It was all gone, every inch of it! I mean, It put ads on my desktop that weren’t only non-closeable, but multiplied themselves by two when you tried to close them. But, on the bright side, no more peanut-butter! It’s good to hear that you already tried our software. It’s encouraging to hear that it took away all the “peanut butter” as well. However, I would like know more about the nature of the issue that you mentioned. Would you be able to give me more information about it? Would it be possible for you to get a screenshot of the 2 windows that you tried closing? I’m here to help. Hi, I have a 10 year old laptop that i think could really use something like this but i just finished getting a ton of malware and viruses of from previous programs that try to say the same thing. What i was wondering is can you give me a log of virus/malware scans for your program. SPECIFICALLY Malwarebytes, Webroot, Norton, and McAfee. I might think of getting this program if all these are provided. I know if there is anything suspicious in the log. If it turns up as a PUP as stated earlier in this article i will reserch what type of PUP it is and i will not just completely deem it as an unsafe program. Thank you. Thank you for your interest in SpeedFixTool. You can definitely check scan logs by following the instructions here. If you like the program, please contact us and we will offer you special deal. or something like that. I will provide a log after i get home but I just wanted to hear your opinion. It also alerted me when i went to download it, the article i went to was a yahoo ad and when i clicked any of the download links it said the website was Malicious and contained links to programs with Viruses and other threats. I proceeded to download anyways for i knew i could fix it at any time. Anyways, i will reply with a link to the log soon as i get home. p.s. I just noted in your response you said you’d offer me “special deal” and how do you put words that have links, do you use mark-up? I can understand your frustration. In our article we speak about a Free Analysis Tool, i.e. a free trial version diagnoses computer problems for free. To clean the problems you have to pay. This is explained in the article as well as in our pricing page. Our free trial version scans your machine and checks for computer problems free of charge. A paid subscription though is needed to proceed with the cleanup process. I encourage you give it a try! We have a 30-day money back guarantee in case you are not satisfied. I am confident though that it will be a worthwhile experience for you. To upgrade to our premium version, please click here (instant $10 discount will apply). I am intrigued by your program and can say I have used other registry cleaners the purported to improve performance and have experienced the pop ups and other unwanted happenings. I currently use Enigma product RegHunter. How does your tool compare to it? I also purchased and use Malwarebytes. Just looking for some input from you regarding your products’ performance in comparison. P.S. I also admire your defense of the product. I agree that just because you are a new company and are not based in a top 3 country that your product should not automatically be labeled scam. Internet users have been “scammed and abused” for so long that we are extremely suspicious and protective of our systems. Not quite sure how you can overcome this but you certainly are putting up a valiant effort. I totally understand where you’re coming from. We always advise our customers that if they already have a registry cleaner on their computer and it does help, then there’s no need to use our software anymore. I can’t vouch on how effective RegHunter is but I can confidently say that I personally use our product and can attest to its value in doing what it’s suppose to do and that’s to optimize my system’s performance. You do have a good anti-malware there in Malwarebytes which takes care of outside threats and is very different from what our software does. Coupled with a good antivirus then you should be pretty much set up. If you still want to try SpeedFixTool then please send us an email at [email protected] so we can assist you properly. Lastly, I would like to thank you for your recognition on the effort that we’re trying to put in to build our company from the ground up. It’s customers like you that give us the drive to continue what we have started and perhaps make a small difference in this side of the business. Well I will give you this much… The ad I saw was very misleading it showed a picture of a man’s hand on one of his fingers was a micro chip. The caption read “this is why your computer is slow” The body of the text went on to claim that manufactures build laptops and pcs to fail (That is true of most products these days) Then claimed your software would fix this. The obvious implication being that the software would rewrite some “secret planned obsolescence code hidden deep within the hardware. Your product may be good it may be bad I don’t know. After seeing the ethics of the advertising I would never risk my money on the product. Thank you for pointing that out. We will definitely consider your opinion on this and will apply all the necessary changes on our next ad. It may have deterred you from using our product but I do hope that you can give it a try someday. If your software is truly an anti malware, then why doesn’t it let you uninstall it without buying the full version huh? Our software is not an anti-malware. SpeedFixTool is a PC optimizer and cleaner which helps maintain your computer for it to perform smoothly for a very long time. Also, you don’t need the Premium version for you to be able to uninstall it. Kindly send us an email at [email protected] so that we can assist you with this process. Your company has a good marketing strategy. Your product is not unique! There are several companies which offer free scans and you have to pay for the clean up. Your ad is deceptive in making belief that your product is unique and you are offering a free product until Jan 3rd. However, kindly send us an email at [email protected] so that we can grant you a trial key for your evaluation purposes. Good Morning !! I have read all of the communications above and have found them all very interesting …BUT …. I am still not quit sure what to believe. Now, I have a process that I use when I am researching a company that I might want to do business with and that is …. I look them up on the Better Business Bureau. Well, I am sorry to say that I could NOT find your company. Is there a reason why you are not listed with the ” BBB ” ? My PC is so slow and my husband is talking about getting a new one. As you know, they are expensive and we really can not afford it right now. I am not sure that we could afford a new one even a few months down the road and this is why I would love to find a trusted company that could fix our PC. I also do not want to hear that your response would be that you have a 100% refund. I do not think that it is a comforting response. Surely there is a way for you to prove to all of the folks that sent e-mails that your product is the one that we need to purchase. We are not listed in Better Business Bureau solely because our office is not located in the US. Our main office is conveniently located in Kaunas, Lithuania but we have partnered with SafeCart® to deliver the most secure and the fastest payment processing to customers like you. SafeCart® is one of the leading credit card payment systems, providing a secure and easy-to-use method, for internet shoppers to purchase downloadable software. It is 100% safe and secure, backed by Verisign and TRUSTe security certificates. It is accredited by Better Business Bureau. Send us an email at [email protected] so that we can give you a better deal. Don’t offer a product as FREE! which isn’t. And don’t design the product so that when the user decides they don’t want to register, they can’t un-install it. If your so confident in this product, be up front about the cost and make it un-installable. THAT’S WHY PEOPLE ARE CALLING IT A SCAM! Obvious deception and dishonesty, before actually even using the product is a big fat warning for anyone. In our article we speak about a Free Analysis Tool, i.e. a free trial version diagnoses computer problems for free. To clean the problems you have to pay. This is explained in the article as well as in our pricing page. With regard to the uninstall process, let’s discuss that once you have tried the software on your system. Hopefully, there wouldn’t be a need for it anymore. one small problem. You get this same comment and offer even if your computer is certified virus free and the registry is so clean it sparkles in the sun. And if you look at the ‘junk’ the cleaner pulled up, and check it on google, you’ll find it doesnt even exist. Its all made up names. They will spruce up your computer, yep. For free they tell you what’s wrong, but to fix it, it costs a LOT of money…nice try. We never claimed that our software will rid your computer of viruses. Ours is not an antivirus but a PC cleaner. Our software is designed to speed up slow computers by diagnosing and automatically repairing problems in the registry. SpeedFixTool is adware / malware / spyware and virus-free.﻿ Our program performs a real scan with genuine results. I highly doubt that you can back up your claim that our scan results were just made up. Our program has been downloaded over 50 million times in the entire world, and our customers are happy to use it. Compared to our competitors, ours is still a very practical alternative to most of the famous ones in the market. All the best on your quest for a better system performance. I downloaded the program installed it then realised you charged me 15quid upfront and then wanted £10 a month didn’t check the T&Cs properly not happen again.?? Once I have the above listed information then I should be able to pull up your account easily and help you with your concern. 2. Making my computer worse than it already is if I do pay for the licence. I don’t have a lot of time to spend on the phone or emailing Customer support to fix it and what if they can’t fix it and made it worse??? besides de money back garantee, what do I do if my PC is worse and I can’t use it anymore? On the add it looked like THE answer for my slow computer but after reading the reviews, I’m not sure. Thank you for letting us know about your qualms regarding our product. I appreciate that you took time to let us have our chance to respond to this. First off, it’s not true that our software can’t be uninstalled. Most of the time, those who try it out miss the uninstall button during the process. On some rare cases, our software becomes corrupted and loses some files that are needed due to the fact that there were other registry cleaners or PC optimizers installed on the same computer trying to outdo the other thus causing internal issues. Secondly, as per experience, almost all of the customers that we supported who reported this issue, also has other registry cleaners installed as well. This kind of setup is not recommended at all. I’m not at all surprised that it gave a different result. If you have any other queries and concerns, then please send us a quick email at [email protected]. We’re here to help. Do you have a copy of the scan results that you had with Webroot? Would you be able to send it to [email protected] so we can check it? I agree with the above review. This is advertised as free and it is not. My computer is running so slow that I decided to give it a try. I paid the $29.95. They offer you the 2 year “such a deal” price which I did not do because I just wanted to see if the software worked first. And…The software did absolutely nothing to speed up my computer. My computer is still slower than ever. On a positive note, I called the number that safecart provided if you want a refund. I spoke to a person within 5 minutes and received an email confirmation that I will be receiving a full refund. Buyer Beware…if it sounds to good to be true….it is! We already responded to your query on our support site and would just like to clear out the things that you mentioned here. We offer it FREE for our Trial version which scans your machine and checks for computer problems. If you go back to the advertisement that you saw, all the mentions of free there were “free scans, free analysis…” and the like. It also stated there that “If you like what you see, you’ll have the option to upgrade to the premium version…” We will never resort to selling tactics that would stain the integrity of our company. With regard to the issue of your computer, there are a lot of factors that we can consider why it didn’t work. Do you have any other PC cleaners installed on your computer? Is you computer infected with spyware, malware or even viruses? Is your hard drive almost full? How I wish I was able to help you with this issue before you decided to cancel it. It’s good to hear though that you appreciated our simple efforts in granting you a full refund when you felt like you were not satisfied with it at all. It’s our way of extending our gratitude to customers like you who even bothered to try our software. In line with this, we are still committed to serve and assist customers all over the world and perhaps in our own little way, make their everyday computing a very pleasant one. Hi, I have your Speed Fix Tool Program installed on 1 of my laptops. I have 3 laptops & 2 desktops on my network. $150.00 is way to expensive to have a cleaner on each of them. Do you have a package that I can install on my network to keep my computers cleaned up & fast for a more reasonable charge? It’s good to hear that you are pretty satisfied with the results on your laptop. I have sent you an email with a better package for all your computers. You are just like the other 1,000 programs out there on the web! The article on Yahoo says the program is free because the developer wants people to use it and let word of mouth sell it. Well my word of mouth it is just like the other 1,000 out there. You can’t find out how it works until you “buy” it. Hell, I can tell you about issues without a stupid program. Now, I ask you, how does the developer expect people to speak about how well it works if he does let them see it work and make their computer run faster? Very misleading advertisement but of course they will probably delete this post, because of it’s content. I totally understand where you’re coming from. If you go back to our ad, I would like you to check specifically on what our “free” offer is. I would like to hear from you regarding that one. Also, kindly send us an email at [email protected] so that I can give you a complimentary key that you can use for your own evaluations. It would be a little more reassuring if you were to use at least your real name here. You are claiming to be a lead developer, could you explain to me – I am software engineer myself – what your tool actually does that makes it better/different from all other tools out there. We have responded to the query that you sent thru our support team. It is for security reasons why we don’t post our names in our blogs. You should know that all too well as a software engineer as identity theft is pretty prevalent at this age and time. Please check your inbox and thank you for your interest. This program is listed as spyware scam. I suggest people do the research and you will find that there are things to make your computer faster with windows 10. There is nothing that software like this can do that you cant do yourself. Can you share the link where you found our software listed as a “spyware”? Have you ever tried our software at all? In all fairness, all computer fixes in the world can be done manually as you have mentioned. Apparently, for most people, a tool that can automate the fixes would really mean a whole of difference. That’s where we, as a software company, comes in. It’s such a sorry state of affairs that when someone provides a legitimate piece of software they find themselves subject to a barrage of suspicion and ridicule. I have sympathy with both parties having myself, haven’t we all, been the recipient (sucked in) of excellent marketing, poor product. The internet is an ideal breeding ground for bullies and cowards. I have no idea whether SpeedFix Tool works or not but reason the developers should not have fallen into the trap of copywriting deception which is at epidemic proportions on the net. I do, however believe, they have done their utmost to allay any fears that the software is a scam. Why not give it to one of the detractors from the comments section to review it so then we know whether it works, once and for all. A little truth goes a long way people. I totally agree with your observations and suggestion. We have given complimentary keys to those who wanted to try our software and would really want to hear back from them as well. That is their choice though and not ours. We still believe that amidst all these negativity, people can see the true value that we bring in to the table day in and day out. We never shrink back from any obstacles and we can certainly say that we never beat around the bushes if there’s a technical concern that needs to be addressed. A lot of the so called “established and big companies” can only offer a 24-hour response time to all the queries and concerns thrown at their doorsteps but we, a small startup company, take pride in our commitment to respond to everything within 12 hours. Kindly let us know if you would like to try our software as well. Just send us a simple request at [email protected] and we’ll surely keep our end of the bargain. YOU SUPPOSE DO TO GET A REFUND. TO NOTHING MORE THAN A SCAM. Our records show that you sent us 2 emails last March 2nd and 23rd. On both occasions, we were able to respond to your messages within a few hours but never got any responses from you. We can certainly assist you with your activation concern and we can resolve it in less than 2 minutes. I hope you can give us a chance to resolve this for you. I have also sent you an email regarding this. If you’re not interested with the software anymore or with the support that we’re offering then kindly send us a quick email and we’ll process your request right away. Sounded very good. I downloaded the “free” application and did the scan. It found many problems. But when I went to fix, the screen went dead, nothing would happen. I called the support no. and the agent had a foreign accent. That’s okay, but I sometimes have a hard time understanding support agents from other countries. I told him my problem with a “frozen screen.’ He said there were probably problems with my computer and he could take charge of my computer and fix them. First of all, I never allow that to happen unless it’s a company I’ve been dealing with for a long, long time. About that time a registration window opened and I found out that if I registered and paid $29.95 I could get my problems fixed. So I don’t know what the suggestion by the agent was all about. Also, what good is a free scan if you have to pay to get the fix. It’s a come on if not an all out misrepresentation. I deleted the application and have moved on. I apologize for the bad experience that you had with our phone support partner. They do sell an extra service – an advanced repair, but it is targeted to customers who have other existing issues beyond what SpeedFixTool can fix. This, however, is only optional and never obligatory. If you don’t want it then just forget about it. What you have still is a very competent email support team here, ready to assist you on all your concerns… free of charge. Kindly send me an email at [email protected] so that I can give you a better offer than the one that you saw. First of all and in view of all the negative comments I can relate to having a top notch interaction with their support group. I had a few questions about this product and the answers that I received were very much up front and honest. I am running a similar program to SpeedFixTool and was advised that both would do pretty much the same operations and if I was satisfied with what I now have it would be of no appreciable gain to change. That very much impressed me and said a lot about their integrity. I also note that all the comments are replied to, good or bad and that’s rare. I have no horse in this race, I’m just came across this product as you did…….I’m just sayin….. Thank you for letting us know about your positive experience as well. We do strive to provide our customers as well, the best possible service that they richly deserve. It’s good that you see the efforts that we’ve put in as well to address any concerns, whether good or bad. At the end of the day, what matters most is if we keep our customers happy in all situations. Will your best-thing-since-sliced-bread work on my iMac? Interesting to speed-read on all the nay sayers vs. your spirited counter attacks, discourses, and assurances. I see a lot of grammatical errors and wrong spellings from the attacking forces but appreciate you patient reassuring explanations to repulse the barbarians who are on your gates. Is your customer service 24/7? Will the free assessment see how much there is to clean and which plan to recommend for me to pay? I see there are various subscription plans. How difficult or easy will it be, should I decide midstream, to cancel said subscription. Thank you for your interest in SpeedFixTool. We only have 2 versions: Free and Premium. The former scans your software free of charge while the latter has the capability to remove and fix the issues after the scan result. We don’t have a 24/7 customer support queue but we have a commitment to address any queries or concerns in 24 hours or less. Our software though is only available for Windows computers. If you want, you can try MacKeeper for your iMac. I also appreciate how you were able to distinguish the difference in our approach to all the negativity that we have been receiving. It’s always best to take the high road in everything. Even out-of-the-box computers have issues or bugs in it. That’s the reason why Microsoft releases patches and updates just right after it their latest installment. I can guarantee you though that our software provides genuine scan results and if you’re not pleased with it then please feel free to try other similar products out there. If you would like to give it a try, which I encourage you to do so, then just send us a quick email to [email protected] so that we can grant you a complimentary key for your own evaluations. From my initial read of your Ad I thought I was going to get to try your program for free, sure you let me download it and install it that will run to initially show one has a number of issues that need to be fixed on the computer but then one has to purchase to program that I thought would be free in order to see if it works as stated to make your PC run faster…this is the Scam..Download it, install it, run it but then buy it to use it. What use is it that you offer a program that I cannot judge whether or not it has worked according to your advertising. There are many programs out there just like this one that will do the same thing that are really free, such as Advanced System Care. At least I can download it and run it to clean up the registry, Junk files cleanup, Spyware removal, privacy sweep, internet boost and many more. It keeps my computer up and running at no cost. So I would suggest that others out there find these programs. Now off to uninstall this thing. I totally agree with your comment that our free version can only provide you with a scan result of issues and errors in your system. If you want to remove those though, a license key is needed to activate the clean up feature. If you feel that it’s unfair to have it that way, then I respect your take on that. We have always maintained this type of offer since we started and have already helped millions of people around the world. If you are still interested in trying it out for free then just send us an email at [email protected] and we’ll grant you a free complimentary key for your evaluations. However, I wouldn’t recommend the current configuration that you have. If you already have a cleaner that works then I suggest that you stick with it. Having 2 or more cleaners on a single computer would just create more issues, particularly sluggishness on system performance. There’s just no point in trying out other software if you’re already satisfied with its performance. Unless you are not. I hope I made some sense regarding this part. there are so many products like yours out there and they all do the same thing, scan your computer and tell you whats wrong, but in order to see if it will fix it you have to pay for it. well i wont pay for it because i don’t know if it really works without trying it. its like buying a car without test driving it, you don’t do it. so why cant you offer a full version trail so we can see the full affect of the product. take the doubt out of people saying it is a scam. i would like to try it but like everyone else i question whether it is a scam too. I totally understand where you’re coming from. Just send us an email at [email protected] and we’ll provide you a trial key for your evaluation purposes. I have no idea whether or not this product does what it claims to do and I am satisfied with CC Cleaner that I have used for a few years. My purpose in posting is that I am frankly amazed at the claims that it is a scam because ONLY the initial scam is free and to resolve any issues the fix program has to be paid for. It CLEARLY states the fact in your adverts that the FREE download is a scan to see what problems (if any) exist and that the full program to fix any errors is a paid for program. 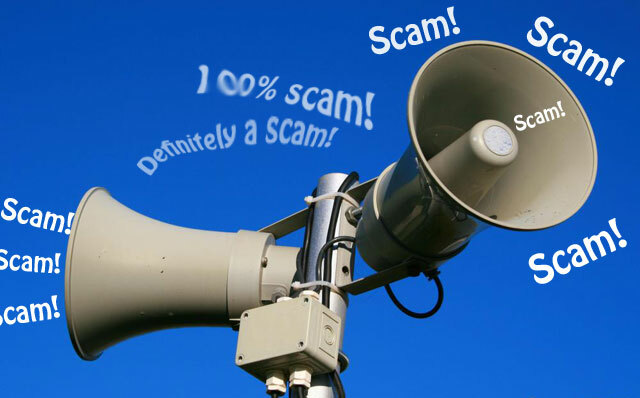 If I was a cynic I would suggest that the majority of the people screaming scam because of the advert are either trolls with nothing better to do or lack a basic understanding of the English language..
As to the complaints that call centre are staffed by foreigners that is a ludicrous thing to say unless of course the product was being sold exclusively in one country when one would expect the call centre to also be based there. Thank you for your honest assessments on this whole blog post as well as on the ad that we placed. I do agree that there were really ones who just posted here out of questionable motives but there were others here as well that genuinely expressed what they have to say and I don’t take that against them. At this day and age, we just can’t please everybody… every single time. It’s good to hear that your software has worked best for you and it’s at this point where I say that if it ain’t broke then don’t fix it. Our phone support partner is based in Florida and has remote offices in the UK, Canada, Australia, New Zealand and Ireland. My take on this as the same as yours. There’s nothing wrong in outsourcing this need to another company. At the end of the day, we make every effort to serve our customers wholeheartedly. I run my own one-man legal services company as a paralegal and have a chronically slow Toshiba Satellite laptop running Windows 7 (I wish it was on XP), and a similarly chronically slow Dell. I avoid web pages containing animated ads because they drink RAM and take ages to download, if they do. I’ve just spent 3/4 of an hour studying all the comments here and your replies, after seeing your SpeedFixTool on Facebook. Precious time which I can ill-afford to use, just to try to verify if your product is genuine and honest. But I never touch a computer problem cure until first Googling the product to check if others warn it’s a likely virus, etc. You come across as very courteous, patient, and amenable people (or person) trying to convince the world you are genuine. You probably ARE totally genuine. But it’s so sad, because I’ve had my fingers burned so often in the past that I simply dare not touch your product. I NO LONGER TRUST anyone when I’ve no proof of who they are and the products they offer. If you are genuine you are going to have to build up a good reputation very slowly, and after fighting against the wind. And sadly I will not be among your customers. The people on here who label you as a scam artist cannot be blamed because they have also been conned in the past. This is what happens when people lie, are dishonest, are greedy, and happy to take advantage of people. Welcome to planet earth, inhabited by human beings who lie and cheat cleverly at every opportunity. I have a sure-fire way of curing my slow computer: back up my data on stand-alone hard drives, then reformat the system with a fresh instal of Windows or whatever. £45 for my local small computer store to do it for me. I wish you well – IF you are genuine in your claim to be helping people with slow systems. IF! I totally understand where you’re coming from and I can’t blame you. I’ll send you a trial key for our software so that you can try it on your end. Hope it serves you well. I thought this was to good to be true, another show you what is needed to be done then Before you clean you pay, before you even see if it works. Any program can throw up and amount of “so called errors” however the proof is in the eating, and you cant even nibble at this one, as the many other rip offs out there. However you may be genuine, but I too have been conned once to often, even by reputed companies that offer the product then you have to contact to get the key and find that someone in the far east wants to control your computor for much more than the original price. If this was as remarkable as claimed then the company would stand by its product and give a 24 hour test on first installation, a simple mod to allow customers to evaulate the product fully (as most bona fide companies do) would allow all of us to be truthful with your product, instead of having a gun to our heads to pay, and then take the long process of trying to get your money back if it does not do all it is supposed to, promises are so easy to break. I totally respect all your points and I understand where you’re coming from. Kindly check your Inbox as well as your Spam folder as I have already sent you an evaluation key. Kindly let us know how it goes and send your future queries and concerns to [email protected]. I hope it serves you best. I do admire you for your calm, polite and well-expressed individual responses to even the most intemperate of this long list of complaints, even though most of them do no more than boringly rehearse the same old points. Most of the competing products on the market are promoted in exactly the same way as yours (free to scan, pay to fix), and I can understand that that is probably a much more effective way of getting people to try the product than merely offering it for sale. And, obviously, the inherent danger of the alternative of giving everyone a 30-day trial period is that people will download the product, use it once and then not bother to subscribe when the time comes. So I am unsympathetic with the vituperation of your complainants. I also find it quite unconvincing, as I think it unlikely that any of them was genuinely taken by surprise. Actually, I’m quite perplexed by these people. Do they really expect a small, recently set up concern such as yours to give away its products entirely free? Do they stop to think that, if you did, your only recourse would be to finance your operation by pop-up advertising and/or by selling customers’ details, which is what many of them profess to hate so much?! I have tried various such programs in the past, specifically jV16 Power Tools and ccleaner, which seem to have the best reputation, and I have never noted much impact on my computers’ (I have three) performance, and in some cases I have encountered minor problems after using them which may or may not have been caused by them. I was interested in SpeedFixTool in the hope that it might represent step forward in that particular technology. I downloaded the .exe file and scanned it with both Avira Antivirus and Malwarebytes, which I consider trustworthy. Both of them gave it a clean bill of health (not even any PUPs), so no malware issues there. These gave me pause, not because of any specific warnings about your program but because of their caveats about registry-modifying programs in general. So, before I install SpeedFixTool, perhaps you could get back to me to really convince me that I should. Thank you for taking time to check out all the posts on this blog. It’s good to see that you took the high road on this one. We are one in heart on this. At the end of the day, I use it and am convinced of it’s capabilities to maintain and optimize my computer on a daily basis. I have really not taken the time to read all the reviews for the simple reason that it is not clearly stated just who you really are. Please do post a CV – I will check back – the email address above does not, to my knowledge, exist (including the sender’s information – written from a completely different source). Which email address were you referring to? My apologies as well if we can’t comply with your request to post a CV on this blog. We are fully aware of identity theft and anyone who has enough information about anyone can eventually find a way to access all the confidential information on any given day. We have an office in Kaunas, Lithuania and our developers are from the US. I hope that’s enough for you to even try out our software. I am a founder of SpeedFixTool. You don’t need my CV to evaluate the product. If you make your purchase decisions based on developer CVs, good look with that! As for email address, a sole email address that you need to reach us is [email protected]. You will get an immediate response no matter what your question is. Someone has hacked your site. You have my phone number, Please call so I can tell you what happened. What made you think that our site was hacked? Please send your queries or concerns to [email protected]. To get me to sign up for free and to clean my PC it says it will clean instantly……ok i did but it did not clean as it said it would? Please send us an email at [email protected] so that we can give you a complimentary key for your evaluations. I have been using SpeedFix successfully for about a year. I was perplexed about all the negative comments above, so I did a little research. According to Virus Total 9 AV vendors identify SpeedFix negatively. This includes McAfee that IDs it as an Artemis variation and Symantec as a PUA (Potentially Unwanted App.). About four times that number give SpeedFix a green check mark. (This includes Kaspersky and Microsoft.) But very recently my WebRoot software has ID’d SpeedFix as a PUA as well although it has been guarding my computer for a long time with SpeedFix installed. Crazy huh? I applaud all the cautious people who wrote in about legitimacy concerns for the SpeedFix product. As a former IT administrator I used to have a sign in my office that read: “Only the Paranoid Survive”. In this day it is very wise to be ultra cautious about downloaded software. But for your reader’s information I have found SpeedFix to be a legit and helpful program that helped me clean up my registry and keep it clean. Anyway, I do have a real question: My latest SpeedFix scan identified HKey_classes_root subkey “.pano” as an ActiveX or COM problem. This also occurred with HKey_Software_classes .pano. I question why this occurred since both those subkeys seem only to identify Panoramic files, but have no active component themselves. I appreciate that you have really taken the high road on this apparent attack on our reputation but would always welcome anything to better improve how we relate and serve customers like you. This is another scam. I bought this software back in April and got a new pc. I tried to install it with my key but it didn’t work. I called support and they were “happy to help me” but OF COURSE THAT INVOLVED TAKING CONTROL OF MY PC, WHICH IS F**KING BS. it’s simply bewildering how many scam artists are out there now, especially those posing as Microsoft support. Ugly, dishonest lying f**ks — everyone of them. They should be locked up. Activation would fail if your PC was reset (reformat or OS upgrade), uninstalled / reinstalled the software, and / or have tried activating the key on a different computer. In all these, a license key reset is needed for it to be activated again. I also checked our database and there was no record of any interaction (email) on our end. You may have contacted our phone support partner. Apparently, they don’t have the tools to reset the key. Please send us an email at [email protected] and I’ll guarantee you that you’ll get the much deserved assistance you were looking for.